When adjacent cables carrying three phase current suffer a short circuit cable fault, the induced magnetic fields result in the cables experiencing significant opposing forces - a safe electrical cable installation requires well designed and thoroughly tested aluminium cable cleats or cable clamps. 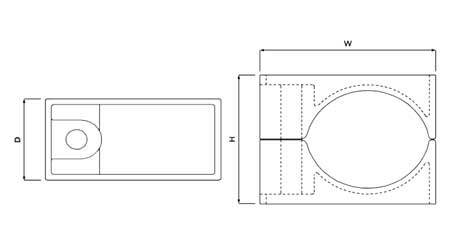 Ellis Patents Aluminium Single Bolt Hole Cable Cleats and clamps are recommended for higher specification cleats installed in temperatures of -60 to + 100 Degrees Celsius, this includes cleating of power cables in dry industrial, outdoor unpolluted and sea air locations when epoxy coated. Cast aluminium alloy cable cleats in plain LM6 aluminium to BS1490 for dry indoor use or outdoor unpolluted areas - Ellis Patents aluminium cable cleats (single bolt hole) can be epoxy coated for harsher environment installations such as sea air and contaminated conditions. 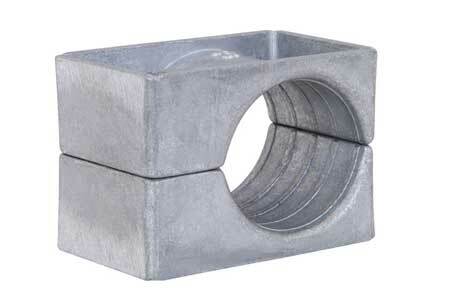 Aluminium cable cleats with single bolt (M10) fixing holes offer space saving cable support and are designed to be easily stacked - the cable cleat design allows direct fixing onto cable supports including cable channel and ladder. 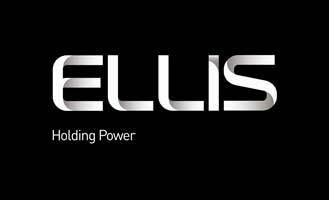 Ellis Patents single bolt hole aluminium cable cleats and clamps suit cable diameters 13-71mm. Aluminium single hole cable clamps have been tested in accordance with the European Standard of "Cable Cleats for Electrical Installations" BS EN 50368 : 2003 - Ellis Patents are the global leader in the manufacture of quality, trusted cable cleats. T&D distribute a comprehensive range of cable cleats suitable for industrial cable applications - Ellis Patents provide cable cleats for single, trefoil, quadrafoil and bundled cable cleat installations. YouTube Video Playlist : Ellis Patents Cable Cleats, Cable Clamps & Hooks. T&D distribute the complete range of Ellis Patents cable cleats including mulicleat, trefoil, claw, hook, single and two bolt cable cleats manufactured from plastic nylon (LSF), stainless steel and aluminium for LV-HV cable support and containment in short-circuit conditions.